The prostein gene encodes a 553-amino acid type IIIa plasma membrane protein with a cleavable signal peptide and 11 transmembrane-spanning regions (1). 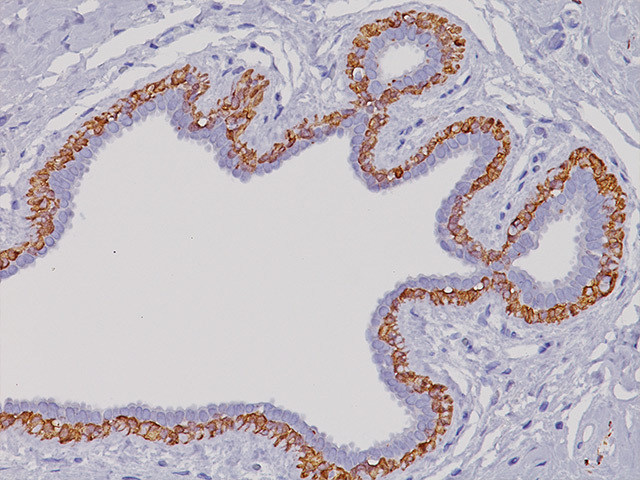 IHC analysis has demonstrated that the Prostein antibody (also known as P501S) was expressed in the vast majority of normal and malignant prostatic tissues, regardless of grade and metastatic status. Prostein expression was not detected in thousands of representative normal and malignant non-prostatic tissue samples (2). 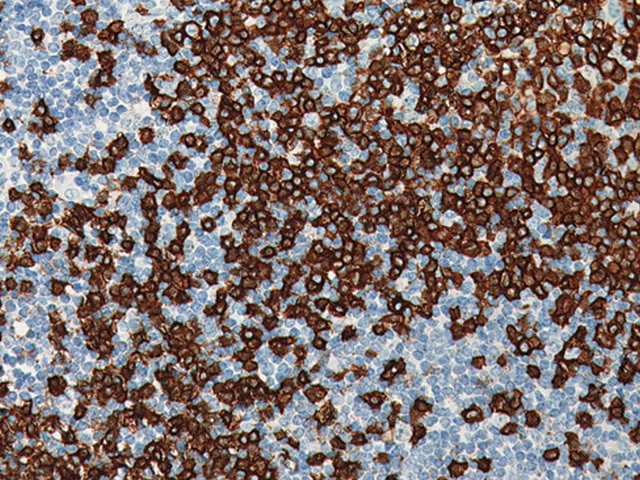 Prostein has a perinuclear-like staining pattern, as expression is found in the Golgi complex of prostate cells (3). Compared to the PSA antibody, Prostein was positive in 99% of metastatic prostate adenocarcinomas while 97% of cases were positive for PSA. 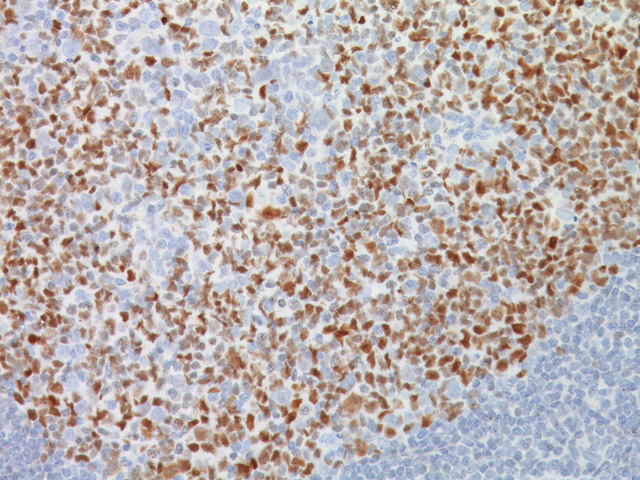 No tumor was negative for both markers (3). The International Society of Urological Pathology suggests the use of PSA, Prostein, NKX3.1, AMACR, GATA3 (or HMWCK and p63) and ERG antibodies for identification of prostatic adenocarcinoma in atypical glands and for differential diagnosis vs. urothelial carcinoma (4). Simultaneous stains with Prostein and PSA or NKX3.1 may greatly improve the detection rate and identification of a significant majority of prostatic metastases, especially poorly differentiated carcinomas of an unknown primary (3-5). 1. Xu J, et al. 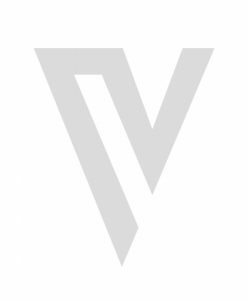 Identification and characterization of prostein, a novel prostate-specific protein. Cancer Res. 2001 Feb 15; 61(4):1563-8. 2. Kalos M, et al. 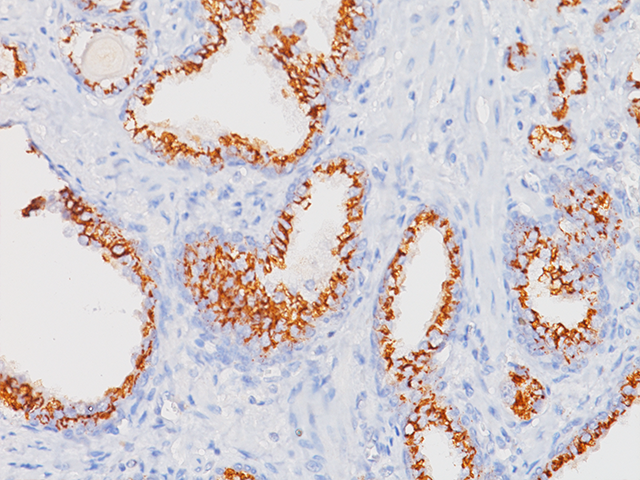 Prostein expression is highly restricted to normal and malignant prostate tissues. Prostate. 2004 Aug 1; 60(3):246-56. 3. Sheridan T, et al. The role of P501S and PSA in the diagnosis of metastatic adenocarcinoma of the prostate. Am J Surg Pathol. 2007 Sep; 31(9):1351-5. 4. Epstein JI, et al. Best practices recommendations in the application of immunohistochemistry in the prostate: report from the International Society of Urologic Pathology consensus conference. Am J Surg Pathol. 2014 Aug; 38(8): e6-e19. 5. Gurel B, et al. 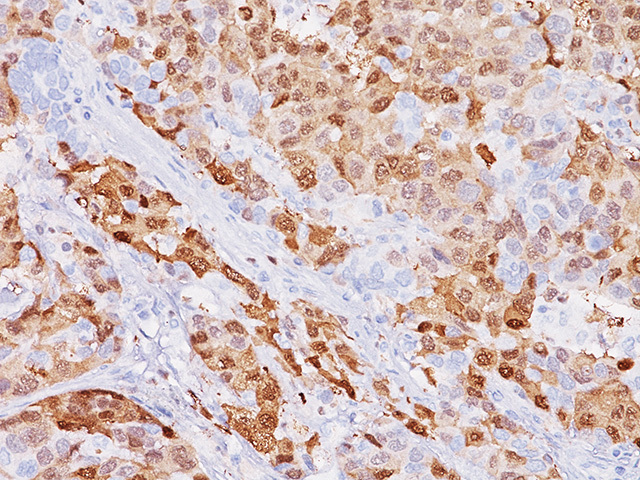 NKX3.1 as a marker of prostatic origin in metastatic tumors. Am J Surg Pathol. 2010 Aug; 34(8):1097-105.